11 years and counting! The craft beer scene in Iowa continues to boom. New national brands are arriving monthly and the list of Local brewpubs and breweries continues to grow. This year will be the biggest and best yet. We will have around 60 breweries and distributors represented pouring over 200 beers. Jordan Bruce and the Derelctics will be performing. We will have food to purchase. All of the proceeds will go to the American Heart Association. Come enjoy an afternoon in downtown Cedar Rapids, drink some awesome beer, and support a fantastic charity. 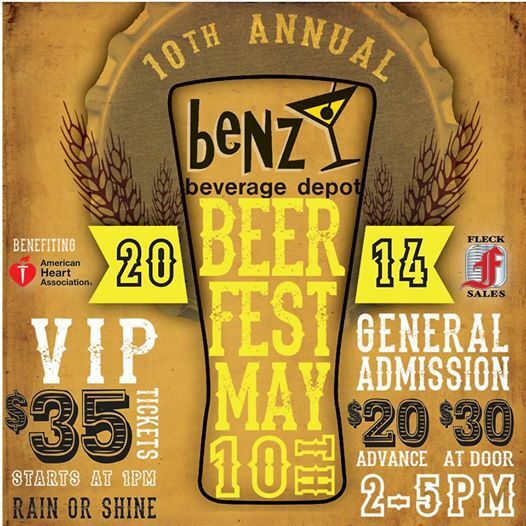 Tickets are on sale at Benz Beverage DepotIt’s hard to believe that we have been doing this for 10 years. Come help up celebrate a decade of beer shenanigans! This year will be the biggest and best yet. We will have around 50 breweries and distributors represented pouring 50… 100… I don’t know it will be a lot of beer. The Diplomats of Solid Sound will be performing their soul music with a modern garage band twist. We will have food to purchase. All of the proceeds will go to the American Heart Association. Come enjoy an afternoon in downtown Cedar Rapids, drink some awesome beer, and support a fantastic charity. It’s hard to believe that we have been doing this for 10 years. Come help up celebrate a decade of beer shenanigans!